Figs have been on my mind lately. I often see them featured in magazine recipes and sitting in cartons at the grocery store, but I rarely buy them. I love the deep purple of their skins, the peridot and pink colored insides. The smell of figs cooking is soothing. You’ll notice it too, after they’ve been cooking and are close to reaching the congealed jam consistency, they will emit a perfume that, if you’re like me, will remind you of wine tasting and picnics and summers spent outdoors. Fig jam has many uses. Spread some on your morning toast or English muffin. Pair with cheese and crackers, and one of my favorites, spread on these sandwiches. There’s no need for a recipe here. 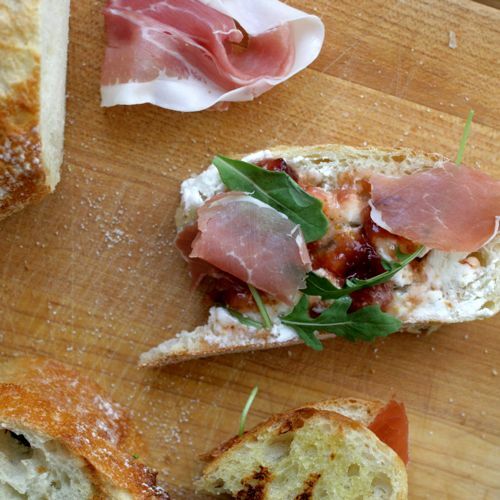 Gather some bread, a log of goat cheese, a handful of spicy arugula, thinly sliced prosciutto, then layer everything on top with a smear of fig jam. If you like your jam a little less chunky, use a potato masher to break up the fruit before storing, or puree in a food processor. In a large saucepan, gently combine the fig pieces with the sugar and let stand, stirring occasionally, for about 15 minutes, until the sugar is mostly dissolved and the figs are juicy. Add the lemon juice and water and bring to a boil. Simmer the fig jam over moderate heat, stirring occasionally, until the sugar is dissolved and the fruit is soft, about 20 minutes. The liquid running off the side of a spoon should be thick. Spoon the jam into jars or plastic containers. Let cool to room temperature, then store in the refrigerator for up to 3 months.